Three programs tackle Office 2007's locked-down user interface. Two take you back to the menus of Office 2003, while one lets you customize the Ribbon itself. Microsoft Office 2007's new Ribbon interface, which discards the familiar menus and tool bars of earlier versions of Office in favor of tabs that group icons, options and drop-down menus, is certainly the first change you'll notice when you open Word, Excel, or PowerPoint 2007 for the first time. The interface isn't just a radical departure from previous versions -- for the first time in Office's history, this collection of commands and options can't be modified from within the applications themselves. Microsoft says a survey it conducted revealed that only a small percentage of Office users modify the interface. Furthermore, an unchangeable interface can streamline UI-related calls to your help desk. Nevertheless, Office power users have been clamoring for a way to customize Office 2007 apps since the new interface was unveiled. Sensing an opportunity, third-party software vendors have stepped in with products that either replace or enhance the new Ribbon interface in several Office 2007 applications. We examined three such programs. Classic Menu adds a tab filled with Office 2003 menus (it's organized to look much the same as the old familiar Office 2003 applications), though it isn't customizable. ToolbarToggle can be customized much like Office 2003's menus and tool bars can be, and you can use it in place of (or in concert with) the 2007 Ribbon. These two products are designed to ease the migration between Office versions. If your business has hesitated to upgrade because of the learning curve your users may encounter, using Office 2003-like tool bars in Office 2007 applications can smooth the transition. The third program we examined doesn't look back at 2003 at all. Instead, RibbonCustomizer is designed to let you tweak the 2007 Ribbon (within the constraints Microsoft has established), so it appears to your specifications. It's not a matter of easing into a new interface; it's a desire for the Ribbon to look the way you want it to, just as customizable tool bars did in past versions of Office. If you're a power user who wants Office 2007 to follow your lead, the products reviewed here offer you a way to wrest control of the Ribbon away from Microsoft. Installing Addintools' Classic Menu is simple: you choose whether you want a new tab at the far left or far right of existing tabs, and once complete, Word, Excel and PowerPoint sport a new tab (called Menu) that offers an Office-2003-like set of menus. On this menu you'll see an "All" option, which acts as a drop-down menu of all first-level commands (that is, File, Edit, View, etc.) along the main menu of Word 2003, each with a pull-out submenu with the remaining commands. The other menu items on the Menu tab repeat these options but are displayed horizontally. 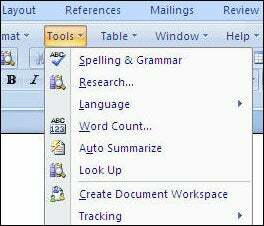 New 2007 commands, such as File > Publish in Word 2007, have been logically placed on the menus, usually at the bottom of the drop-downs. Classic Menu is implemented as a new Ribbon tab, so it doesn't interfere with the underlying code of Word, Excel or PowerPoint 2007. Once you get past the top-level menus (File, Edit and so on), you'll find command lists that use the Office 2007 icons. Not everything is implemented exactly as it was in the 2003 versions of Word, Excel and PowerPoint. Some differences are nits: the View command includes a "Header_Footer" command instead of "Header and Footer." Other differences are odd: The Tools > Macro > Macros command in Word 2003 is presented as Tools > Code > Macros in Classic Menu for Word 2007. A further eye-catcher not found in Word 2003: There are two Page Setup commands on the File menu, one to open a dialog box and the other to open a submenu of setup commands. You can't make changes to Classic Menu's choices -- the program installs its new tab, and that's that. One option you may want to use: Add the new Menus tab to the Quick Access Toolbar and then hide the Ribbon. This lets you call all commands from the QAT icon without being distracted by the Ribbon.